The week before my birthday coincided with one of the largest Loy Krathong festivals in the city of Bangkok. At The Golden Mount, locals celebrate Loy Krathong by climbing from the temple complex to the mount, while reflecting on the past year. 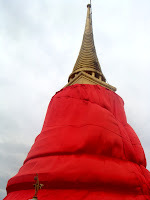 They write their names atop the mount, wrapped specially in red silk for the holiday, and send their hopes for a peaceful new year to the winds that whip the spire. Then, they enjoy the raucous street festival's activities at the bottom of the mount after their reflective climb. The whole activity sounded like a perfect celebration to ring in my birthday-- a bit of old Bangkok's serene and reflective personality combined with a healthy dose of fun and festivity that is ever present in modern day Bangkok. So, hopping a cab with my "always up for an adventure" three year old in tow, I set out to experience The Golden Mount for the first time. After a surprisingly mellow, traffic-free taxi ride, we arrived at the temple grounds where the annual Loy Krathong festival was just setting up for the day's business. Vendors were unmasking their stalls for the final day of the nine day festival by removing tarping that had been wrapped around their goods for the night. Large feather dusters were being flicked across the merchandise and charcoal barbecues were being lit. Hoping my son was game for a bit of a climb, I hopped out of the cab and whispered a little prayer that I wouldn't be carrying a three year old up the stairs that rose steeply in front of us. Grabbing his hand we began our ascent of the 318 steps ahead. And, what amazing fun the climb turned out to be. Man made waterfalls gurgled along the path and multi-color candles rested on concrete steps spilling their warm wax on top of the day's previous meltings. As we passed a tea house, my son vowing aloud to stop on our descent for a refreshment of what would be teeny watermelon slices, made out of shortbread cookies, and steamed milk delivered in a silver edged porcelain tea cup. 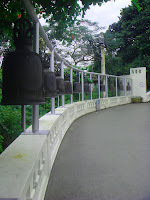 On our climb a bit further up, and ever closer to the mount, we came across a large flat outdoor foyer lined with giant antique prayer bells. Following the few other individuals also on their climb, we picked up the available mallets and smacked the bells one by one to create a deliciously rich symphony over the rooftops of Bangkok. My son's smile spread deeply as he whacked each one with renewed gusto. Perhaps the transformation I felt occurred because of his joy in the bells or perhaps it was due to the climb. But, either way, each smack of the bells took me deeper physically into a sense of calm and well being. 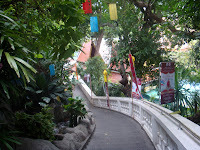 I admired the temple's statues and looked out over Bangkok's tiled rooftops as my jangly earrings rang in the breeze. I smiled as my son giggled at the monk who lifted him to ring another bell. And, in those moments, even before reaching the site that tourists climb to see, I realized that this was a feeling I wished I could bottle up and keep forever. The combination of the activities already described, the low chanting of the monk's surrounding the base of the temple and the gentle breeze whipping warmly around us, provided an ancient serenity. When you are craving something deep-fried, but want to ease your conscious with something that is usually healthy, give this recipe a try. Completely delicious and satisfies the need for a crunchy fry. And, even if you think you don't like tofu, give this a try... you might be surprised! Combine the flour, cayenne, pepper, salt, sugar and chives in a shallow dish. Add the tofu and roll to coat. Remove from flour, gently dusting off extra, and set in a single layer on a tray. Using a large saute pan, add just enough veggie oil to lightly coat the bottom. Heat the oil over medium heat and add the coated tofu, working in batches if necessary for the size of your pan. Cook each of the four sides until they reach a deep golden color (I find flipping them with a pair of long chopsticks works very well). Remove from oil and place onto a towel lined plate. Serve immediately with following dipping sauce or transfer to a cookie sheet and reheat in the oven until warm (about 10 minutes at 350 degrees F). In a saucepan, add vinegar, sugar, ketchup and salt. Stir to combine. In a small bowl, mix water and cornstarch until smooth and no lumps remain. Using a wire whisk, stir the cornstarch into the vinegar mixture, until smooth. Turn on the heat and continue to whisk until the mixture thickens, about 2 minutes. Turn off the heat and transfer to a serving bowl. Been to Bangkok three times and never went to the golden mt. I'm going on my next trip thanks to your experience and description. Thx. I love the golden mount temple. Such great views and not really on the tourist radar. That tofu sounds delish. I'm going to have to try that. How wonderful for you to have this experience and to share it with your kids. Even just as wonderful that you share it so vividly with all of us. new post, new POST, NEW POST! I want a new post pls. Love your blog and need a fix.